"This recipe is not only simple, but is sure to become a family favorite. It may also become an oft-requested dish by friends and neighbors, so be prepared to make a few batches. Goes great with homemade whipped cream (adding a pinch of nutmeg to the whipped cream really adds to the dessert)! = )"
In a bowl, mix together the flour, 1 cup of sugar, baking powder, salt, milk, melted butter, and cream to make a batter. 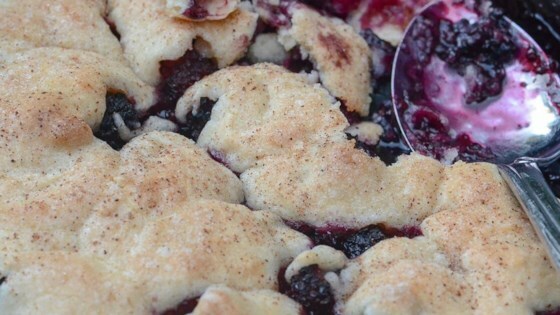 Spread the blackberries out into an ungreased 9x13-inch baking dish, and top with the batter. Sprinkle the top of the batter with the nutmeg and 1 teaspoon of sugar. Bake cobbler in the preheated oven until the top is browned, the fruit is bubbling, and a fork inserted into the center of the batter comes out clean, about 1 hour. Allow to cool before serving. I heated the 6 cups of blackberries with 1/2 c of half and half. I also used evaporated milk instead of regular whole milk. I used a full pint of heavy cream and the flour was almond flour.